The highlight of Thanksgiving dinner is usually the food, but why not pleasantly surprise your guests with some awesome cocktails? From adult hot chocolate to low calorie sangria, there are so many drink flavors, the options are limitless. Here are 7 of our favorite cocktails to celebrate Turkey Day with. Some shots taste strong and aren’t really enjoyable, but these apple pie shots are the perfect balance of sweet and salty. 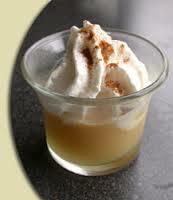 Some of the ingredients you’ll need are vodka, apple cider, whipped cream, and ground cinnamon. This drinkable dessert doesn’t require special preparation, just mix the vodka and apple cider, add the whipped cream on top and, sprinkle on some ground cinnamon!